I haven’t posted in a while because I have been in Orlando, Florida. I agreed to chaperon a senior trip, and while it was fun, it was exhausting. Of course, I paid most of my attention to the plantings. Sea World was a tropical paradise, and even though spring has arrived very early this year, I was envious of the hostas that were so prolific there. 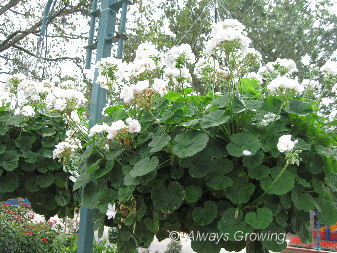 The hanging baskets were also spectacular – so big and full. 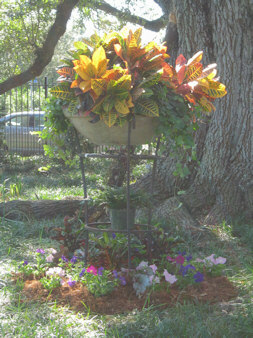 Here are a few of the container and hanging baskets that could serve as inspiration for our gardens. Containers – have to remember to use big ones. 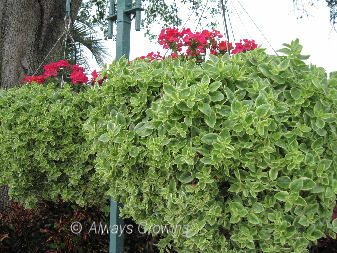 Hanging baskets – the bigger the better. 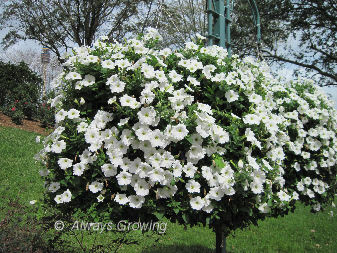 Don’t you just love the white petunias. The other colors were just as pretty. I’ll post some to the plantings later. Finally, we have had some rain. Just like so many areas in the country this summer, we are still in an extreme drought, but 2 inches of rain over the last four days has helped. Of course, even with this rain, we are still way below our normal rainfall, but it is nice to be free from dragging hoses around the garden for a few days. Because of the drought, not very much is going on in the garden this year as in past years. Hardly anything is blooming because I think the dryness and heat seems to be really stressing plants out. They are just staying alive and not really growing. I am hoping the recent rain will help this as it usually does. Because of the drought, that started back in late March, I have not dared to plant several small shrubs that I purchased in late winter. I am holding them over till either we get more rain or early fall arrives. Because of this, I am using more containers in the garden than ever. 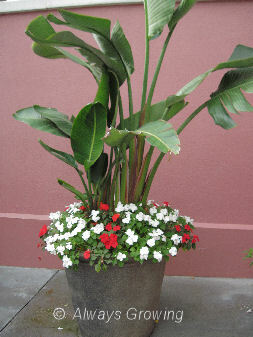 Before, I used containers mainly on the patio or front entry, and they consisted of annuals or tropical plants. Gradually, I stopped planting those, especially the tropicals, because it just got to be too much trouble to overwinter them. I only kept a few favorites in pots or hanging baskets. Starting last year when I pretty much stopped planting annuals in the garden, I did make a few containers of colorful coleus and placed them in areas were the ground was not suitable for planting. This gave spots of color without too much work. This year as I was contemplating a problem spot in the entry garden, I thought of containers as a solution. The area where I needed “something” was under a Kwansan cherry tree and so did not get much sun. 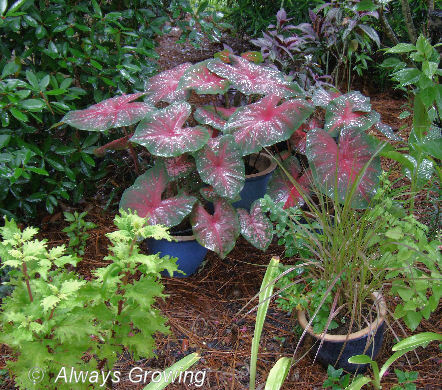 In the past when I planted coleus there, they didn’t do well – leggy, sparse looking. Impatiens took too much water, hosta even failed, and tree roots didn’t make for any deep planting of other shade plants. Finally, I decided to go with containers and thought caladiums (notice the raindrops) should do well. I just wish I would have thought of this earlier. Since this is the entry garden and makes that all important first impression, that bare spot really stood out. Now, with the three blue pots of red caladiums and one pot of Persian Shield in the back, this area looks so much better and blends in nicely with the rest of that garden area which has filled out well since spring. I only wish I would have thought of this container solution sooner. It was rather puzzling. The last two rain storms left water standing in one of the two concrete containers that holds muhly grass. After the first storm, I just tipped the container over and let the water drain out, but this past Sunday when I discover water again sitting in just one container, I decided to investigate. Here is what I found. Yes, a pine tree root has moved into the concrete container and stopped up the drainage hole. I couldn’t believe this. I know I moved these containers a bit during the summer and there was no root then. Also, that is one big root; it’s the size of my thumb. When I place plants outside for the summer, occasionally, I have had roots grow out of a container, but I have never had roots grow into a container before. 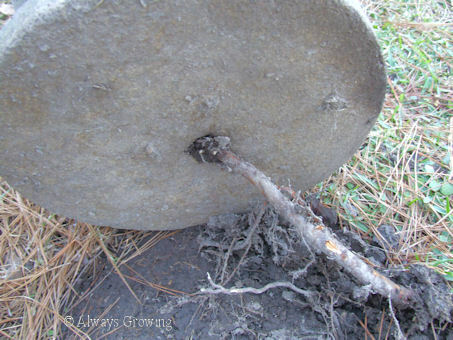 I actually had to use lopers to cut this root. A little reaming of the hole opened up some drainage. This, however, is only a temporary fix. When the weather warms up a bit, I will have to take out the muhly grass, clean out the roots, and replant the grass. Since these containers are so heavy, it will take the brawn of dear hubby to move them to a place off the bare ground. If I want to keep them in the same place, I was thinking I might just place a concrete square paver under them to keep the roots out, otherwise, they will have to be moved to another area (maybe the patio?) where they can be placed on concrete safe from invading tree roots. This just goes to show, that even in the dead of winter, containers need to be tended to. The garden is looking a little tired, and it will be nice when cooler temperatures arrive because the garden always perks up then. Until mid November when the cool season annuals go in, we still have to rely on our summer plants. 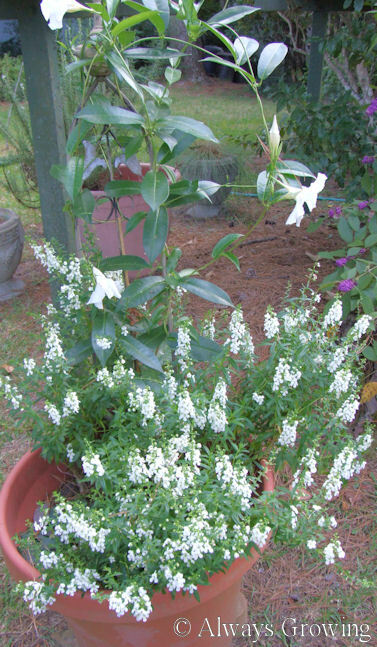 One summer container that is still looking good after months of heat is the white mandevilla vine and angelonia. 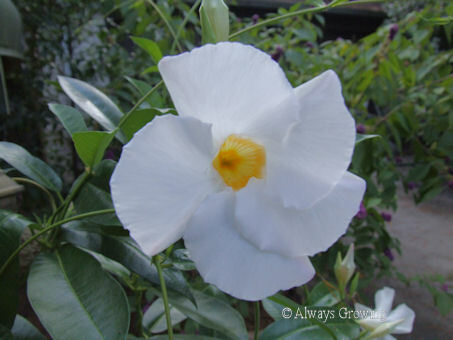 The white mandevilla vine was a cutting rooted by my mother three years ago. This is supposed to survive zone 8 winters, just dying back to the ground, but I have never chanced that. Every winter, I dig it up and overwinter it. I wouldn’t do this ordinarily, but since my mother, who is getting on in years, rooted this for me, I want to keep it as long as I can. This is the best year ever for this vine, and I must remember next year to replant it in this large container. This is the first year I have planted angelonia (Angelonia augustifolia ‘Serena’). I, at first, had planted it in the “white garden”, but it did not do well there. I don’t think it was getting enough sun. It was getting spindly and had few flowers. When I transplanted the plants to the container with the mandevilla vine, they really took off. The two plants I had bought as four inch pots went from being weak, lanky plants to full, flower-laden specimens. Angelonia are supposed to be perennial only in zones 10 and 11, but my mother’s have survived for years in her zone 9 garden, even surviving last year’s colder than normal winter. I am not putting too much hope in mine surviving here in zone 8, but maybe they will reseed. I do think they make a great pairing with the white mandevilla vine. So, even though the garden is looking a little worn out by this time, this container is still making a very nice show as the heat still hangs on a little longer. I can hardly believe that it has been five days since I posted. When I started this blog, it was my goal to post every day so that I would have a good record of my garden. I knew that I would probably not be able to post that often, but if you don’t have a goal it is so easy to give up too quickly. It has been a hectic few days. Dear hubby’s car died and had to be replaced. Is there anyone who likes to go vehicle shopping? I certainly don’t, but finally he found something at a good price Monday night, and after all the negotiation and paperwork, we are now a two vehicle family again. Needless to say, there has not been much gardening going on except for a little weeding Saturday. Since the weather last weekend was so nice – cool, sunny – I really wanted to get some garden work done that I had put off while it had been so hot. This coming weekend is not supposed to be so nice, so it looks like I’ll be finishing up the old garden chores in winter at this rate. Here are some photos of autumn containers that I took a while ago. They certainly give me ideas for next year. The next one isn’t particularly fall looking, but I just love the container. Today, we got a break in the weather. It rained in the early afternoon, and the sky remained cloudy. This kept the temperatures down which will help the electric bill. It really hasn’t rained this year like it usually does. By now, we should be having frequent afternoon showers. Well, I am grateful for even a little rain and overcast skies. 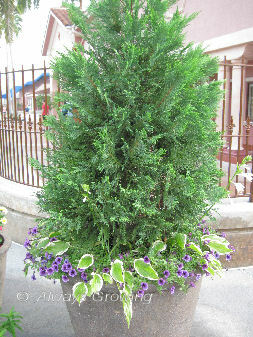 One thing that doesn’t change even if we get a little rain is the watering of container plants. I mostly keep tender tropicals in containers now. I have started a moratorium on new container plants. It is getting to be too much to try and protect them all come winter. I used to have eighteen large hanging baskets of ferns that were gorgeous. I remember my dad (who was a big fern fanatic) asking what I was going to do with all of those baskets come winter time. I blithely replied that I would bring them inside. I did do this several years, and, then, it quickly got to be too much trouble. So, now I have reduced the number of container plants and do not plan on adding any others. Even in the summer, without the problem of winter temperatures, keeping a large number of container plants watered can be a challenge. One of my favorite container combinations is the hosta and elephant ear. They both go dormant about the same time and return in the spring at the same time. This is the third summer this particular one has been in the garden. This has Gold Standard hostas surrounding Metallica elephant ears. The hostas are now in bloom. 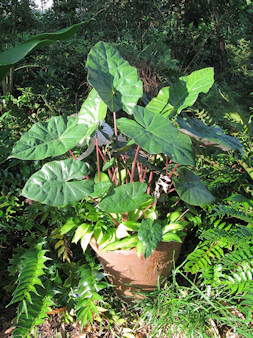 I have a matching container of hostas and Black Magic elephant ears, but, in that one, the hostas are not as vigorous. These containers are too big for me to move by myself in the winter. If a freeze is predicted, I cover the top of the container with newspaper and cover with a large plastic bag. So far this has been enough protection. But, remember, I garden in the coastal South, so I can get by with this short term protection. I know if we would get one of our rare hard freezes of many hours or days, I would have to get help to move them to a sheltered location. But, for right now, all I am concerned with is keeping these containers watered and enjoying the foliage.